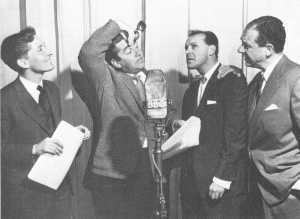 It was on 2 November 1954 that H-H-Hancock's Half Hour had its first broadcast. Tony Hancock was then thirty years old. Tony Hancock had appeared in Worker's Playtime and Variety Bandbox where he was, by all accounts, pretty dreadful. But in 1951 he appeared in a show called Happy Go Lucky, starring Derek Roy; and his scripts were written by two young scriptwriters Alan Simpson and Ray Galton. They became so necessary to Hancock that when, years later, he turned away from them, he found his genius deserting him, and slid rapidly down-hill to a tragic death. But in 1951, the magic began to work. Hancock was cast as Archie Andrews' tutor in Educating Archie, and scored a great success (his catch-phrase, 'Flippin' Kids!' seems embarrassingly weak now, but caught on immediately with listeners). Then, Dennis Main Wilson, who was producing a series called Forces All Star Bill, decided he wanted a resident comic, and invited Hancock to play; the show was renamed Hancock's Half Hour. With Hancock were three men who were to become his familiars for the whole series; Sid James, the most splendid foil, Bill Kerr, and Kenneth Williams as Lord Dockyard and later as Snide with his catchphrase 'No, stop messing about!'. Moira Lister and later Andree Melly appeared as Hancock's girlfriends and, in the fourth series, Hattie Jacques joined them as Miss Grizelda Pugh. By 1955 Anthony Aloysius St. John Hancock of 23 Railway Cuttings, East Cheam, was firmly established in the affections of millions of listeners.